In June 2012, SkyTruth wrote that voluntary hydraulic fracturing (fracking) chemical disclosures from FracFocus.org were only covering approximately 43% of unconventional wells drilled in Pennsylvania. Only 54% of wells drilled submitted a report, and of those that did, only about 81% of the chemicals were actually disclosed (instead of concealed as “proprietary” or “trade secret”). Barely more than half of Pennsylvanian wells had a corresponding report, so I wondered if transparency was any better in our own state of West Virginia. From January 2011 – August 2012, industry operators posted 183 voluntary disclosures for wells drilled and hydraulically fractured in West Virginia. According to the Office of Oil and Gas (a division of the WV Dept. of Environmental Protection [DEP]) there were 1360 permits issued for horizontal wells and/or fracking. My question is: Of the 183 voluntary disclosures, do the numbers correlate with the state data? To put it bluntly: No. State data and industry reports from Jan. 2011- August 2012. A completed FRACT permit is the only record that we know of which positively identifies when a corresponding voluntary disclosure should be on record. However, since the DEP only lists nine records in 20 months of drilling, there is not much we can say statistically. In our experience, the DEP is struggling just to keep up with posting permits and seems to have a very large backlog of post-drilling records, so this low number is no surprise. The second best indicator that fracking will likely occur soon is the presence of a permit. 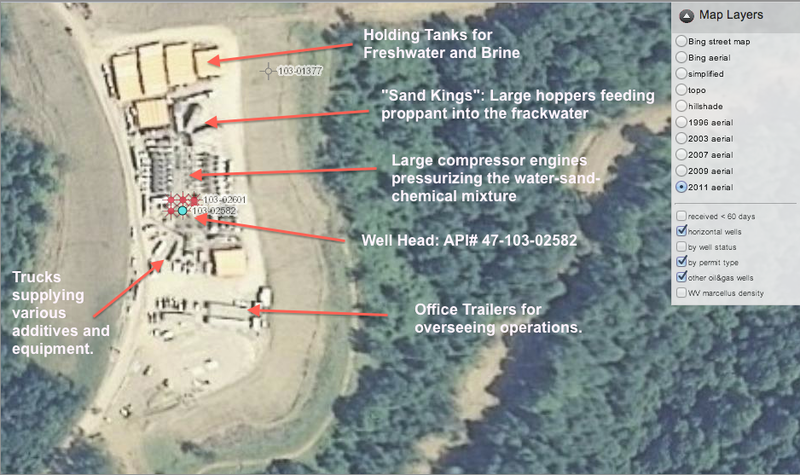 If industry has taken the time, money, and effort to put a rig on the ground and secure fracking permits, then it is likely that the “sand kings”, compressors, and water trucks are not far-off. Yet, with 79 fracturing permits recorded by the state, there is not a single corresponding chemical component disclosure! By the time I found a decent correlation, 231 permits completed and 61 disclosures, I cannot confidently say that a completed horizontal well means that fracking has also occurred. Horizontal wells permitted is even less definite, because while it may be reasonable to guess that these permitted wells will be fracked soon, a guess is not good science. But where state and industry data fell short of the completed well permits, I turned to “skytruthing” to try to get a more accurate rate of voluntary disclosure from industry. Using the WV DEP Office of Oil and Gas Map Search, I looked at aerial imagery from the 2011 National Agricultural Imagery Program (NAIP) overlaid with current well locations across the state. The NAIP imagery is acquired by the Farm Service Agency in summer while the leaves are still on the trees, so I narrowed down my list of wells in question to only the wells what would have appeared on a 2011 fly-over before the leaves fell off. From January to the end of August 2011, the DEP lists 125 completed wells and 30 corresponding disclosures. I then randomly selected 19 wells to check visually, a 20% representative sample of 95 completed horizontal wells that are unaccounted for on FracFocus. Are they really sitting idle as the data suggests? The DEP reports that this Stone Energy well in Wetzel County has six finished horizontal wells, but does not have a single permit recorded for hydraulic fracturing. 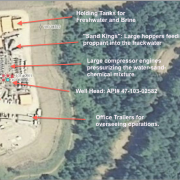 FracFocus has no voluntary disclosures that correspond to these wells, but equipment on this pad is in the unmistakable configuration of an active frack. Some wells l looked at appeared to be prepped for drilling and fracking, but in the absence of wastewater ponds or production infrastructure, I was far more inclined to put a well in the “inconclusive” category rather than make a false assumption. However, there were only 4 that I had any doubts about. Extrapolating from the sample the number of wells that were clearly fracked, and factoring in the 30 wells voluntarily reported by industry, I conclude that for the first 8 months of 2011, industry’s voluntary disclosure rate was 31.6%*. 125 horizontal well permits completed from Jan.-Aug. 31, 2011, but no other state data. 30 out of 125 are disclosed. 95 have no other relevant data: Let’s call them unknown wells. 30 disclosed wells ÷ 95 wells = 31.6% disclosure rate. *I have triple-checked the fact that the value “95” appears twice, but it is purely coincidental. If 31.6% is the absolute best disclosure rate we can calculate for West Virginia, and absolutely no disclosure in categories where the record should be complete, then the public is not being adequately informed. The fault lies with both industry for their poor rates of reporting and with West Virginia for not keeping up with this critical aspect of the public record. The State of West Virginia clearly intends to continue developing unconventional shale gas in the Marcellus and Utica, touting its benefits to the citizens. However, they must keep the official record accurate and up to date in order to properly inform the public. Failure to keep the people informed about what is happening in their state, and even backyard, exposes citizens to uncertain health risks, potential damage to property, and severely impairs decision-making by local, state, and federal government. If the Oil and Gas Industry wishes to convince West Virginia and the world that they are being open and transparent about fracking in unconventional shale basins, 31.6% is not convincing. The current voluntary disclosure system severely hinders aggregate analysis, rendering it nearly impossible to even check the transparency and completeness, but more on that later. For now, know that the chemicals used in 2 out of every 3 wells drilled in the State of West Virginia remain a complete mystery to the public.